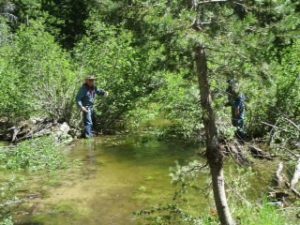 The San Joaquin-Sierra Unit of BCH of California submitted a grant proposal to help cover member’s costs for providing volunteer service to the Sierra National Forest. Work parties were organized to work on both wilderness and non-wilderness trails in the John Muir and Ansel Adams Wildernesses near Edison Lake as well as a second work party to continue to improve the adopted “Chamberlain Camp” near Courtright Resevoir. The mountains of central California received near record amounts of precipitation in the winter of 2016-17. Access to the Edison Lake area was delayed for over a month as crews struggled to plow through nearly 18 feet of snow on the top of the 9200 foot Kaiser Pass. Normally open by mid-May, the pass was not able to be safely cleared until mid-June. This made planning of the work party very difficult, as we were not sure when we would be able to get to Edison Lake, or even what trails would be melted out when we could get there. Faced with the challenges of planning trips this season we decided to do one trail opening trip as soon as we were able and turn the second trip into a work party at Chamberlain Camp. When Kaiser Pass finally did open, we went into a fast scramble to recruit volunteers, organize the food and make plans for a week- long stay based at the High Sierra Pack Station. We ended up with a total of 14 members that spent all or part of the week clearing trails in both the Ansel Adams and John Muir Wildernesses. Even selecting trails proved challenging due to high water levels in the creeks that made crossings unsafe or drifts of snow which covered washed out sections of trails and downed trees. Overall the trip was successful and we cut a total of 28 trees and brushed out a 200 foot section of badly overgrown trail at a creek crossing. I lieu of a second wilderness based trip we chose to spend our second work party at Chamberlain Camp near Courtright Resevoir. This is an historic cow camp that is on the edge of the John Muir Wilderness. 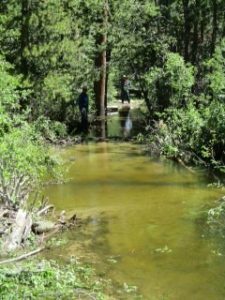 The San Joaquin-Sierra has adopted this area and over a number of years and work parties, has made numerous improvements such as building an accessible outhouse, installing bear proof food lockers, building hitching rails and tables. Old fencing has been removed from the perimeter of the meadow and packed out. The camp is less than 2 miles from the trailhead, over easy terrain, and this makes the camp an ideal location for the unit to take novice riders, youth groups and and members that are interested in learning to pack without the difficulties of packing on a longer wilderness based trip.